3 Palms Pizzeria is a Neapolitian style pizza restaurant in the First & Main shopping district of downtown Hudson. The first time I tried 3 Palms was during the Taste of Hudson last year and it quickly became one of our favorite restaurants in Hudson. The dining area at 3 Palms consists of heavy wooden tables, giving the restaurant a rustic feel. There are large windows throughout the dining area, giving you plenty of sunlight during your dining experience. Make sure you save room for dessert, upon entering 3 Palms, you'll be greeted by the dessert case and the gelato case. 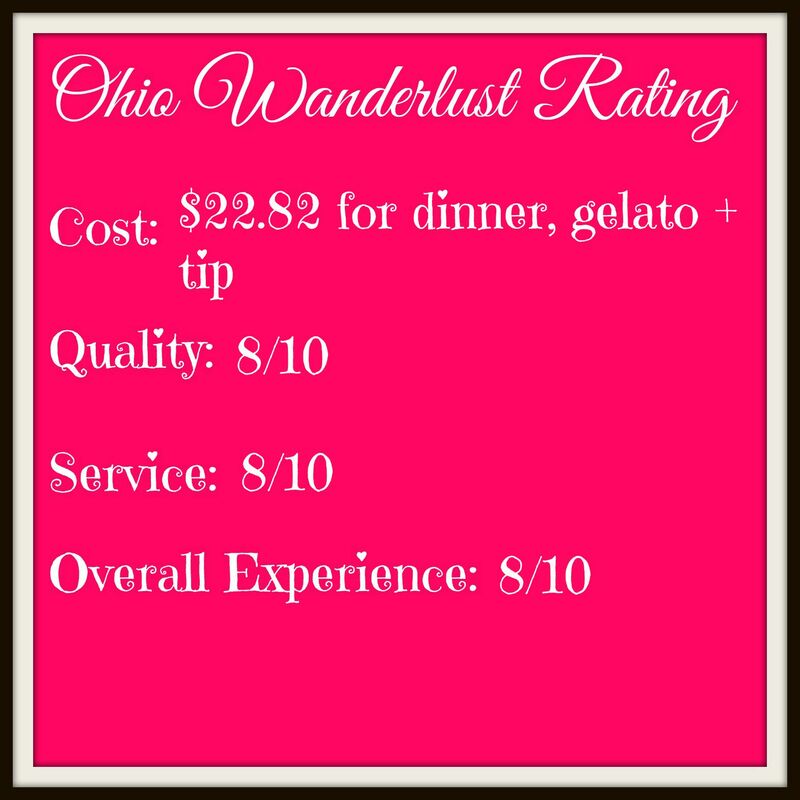 You need to order the gelato, it's wonderful, I've never tried a flavor here that I didn't like. On a Friday or Saturday you may need to wait a little for a table, 3 Palms wrote down my phone number and told me that we could walk around outside and would receive a text when our table was ready. It was an incredibly nice night, so Dave and I opted to sit out on their patio. They have a mix of some larger group tables and some couple's tables outside. The patio is along the front and side of the restaurant, we were at a table closest to the main entrance. However, the patio starts far enough away from the main entrance, that we weren't bothered by people entering and leaving the restaurant. One of my biggest restaurant pet peeves is being seated too close to the main door or the kitchen entrance, it always makes it difficult to enjoy your meal, because there's too much activity. Flowers were everywhere along their gate. We weren't too hungry, so we skipped ordering a starter. If you're hungry for an appetizer, I would recommend the Crispy Fried Artichokes served with lemon roasted garlic dipping sauce or the Antipasto Plate if you're ordering an appetizer for a larger group. We split a Funghi Pizza which includes wild mushrooms, cippolini onions and smoked mozzarella cheese (smoked in house). All pizzas at 3 Palms are prepared in the traditional Neapolitian way and cooked in a wood burning pizza oven. Due to the dough being hand rolled, each pizza may look a little different due to the individual qualities it may have obtained through hand rolling and wood firing. I love the thin, crispy crust that 3 Palms creates with their pizza making techniques and cooking the pizza in a wood burning oven. If mushrooms aren't a food you love, 3 Palms has a large list of pizza options and includes all of the ingredients for each on their menu. I've also tried the Margherita pizza before and loved it just as much as the Funghi. For dessert Dave and I split some caramel gelato. Gelato is denser than ice cream, but it has a lower percentage of fat, allowing the flavors to shine through better. 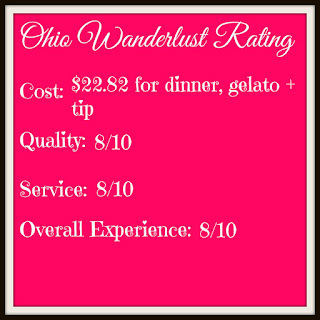 I have never been disappointed with 3 Palms gelato, I'm sure all of their flavors taste divine.